The story of the Irrawaddy Flotilla Company is perhaps one of the most romantic in the history of the Merchant Navy. Starting in a small way and overcoming immense difficulties, it grew into a great organisation which contributed in no small measure to the prosperity of Burma. It developed many entirely new types of vessel, difference problems of navigation were skilfully solved and by careful nursing a huge traffic was created. Then, in the welter of the Second World War the entire organisation was destroyed and re-establishment after the war was hardly begun when the Company’s business was taken over by the state. 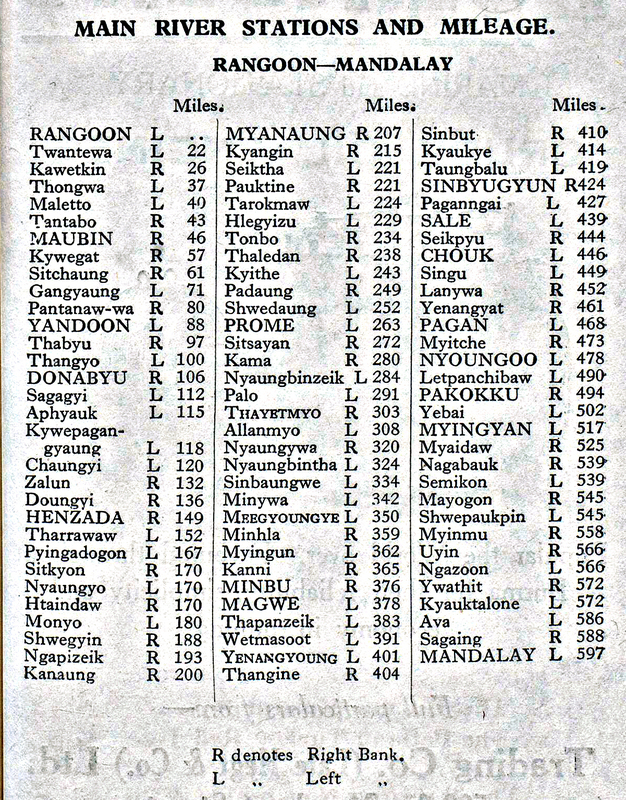 For service in the Burmese War of 1852 the East India Company sent over four small steamers of the Bengal Marine to the Irrawaddy River, and after peace came, three which survived conducted a service between Rangoon and the Frontier town of Thayetmyo, about 300 miles from Rangoon and halfway to Mandalay. They carried mails, government stores, passengers and troops. The service was a dead loss to Government and when in 1864 the firm of Todd Findlay & Company, timber and general merchants, offered to but the craft and conduct a regular service in return for a subsidy, an agreement to that effect was easily reached. Todd Findlay & Co. had no experience in running ships and it was soon evident that the small under powered vessels they had bought would never pay. At this point P. Henderson & Co. came on the scene. In 1865 a Company called the Irrawaddy Flotilla & Burmese Steam Navigation Company was registered; some of the Henderson Partners were interested and new vessels of greater power and more suited to the river were built and put into service. With the first, the Government Dockward at Dalla on the opposite bank of the river from Rangoon had been taken over on lease, and the new vessels were mainly built on the Clyde, taken to pieces and shipped out for re-erection there. These new vessels enabled the service to be extended to Mandalay and later to Bhamo, close to the Chinese frontier, about one thousand miles from Rangoon. The Management side was also strengthened by the appointment as Manager of Mr George J. Swann, by whom the new venture was nursed into prosperity. In 1874 some re-arrangements took place. A service to Moulmein and the towing of sailing ships below Rangoon was given up and a new Company called simply Irrawaddy Flotilla Company Limited was incorporated in Scotland, Mr Peter Denny of the famous Dumbarton firm joining the new Board of Directors. The Denny’s sent out representatives to study conditions in Burma and by 1877 they built their first steamer “Taiping” for the Flotilla, thus beginning a connection which lasted as long as the Company existed. Mr T.D. Findlay was the first Chairman and another Findlay of the Todd Findlay connection, “C.B.” also became a Director, the fourth being Mr James Galbraith of P. Henderson & Co.
feeder services were opened in lower Burma. Till 1885, however, matters drifted on in a somewhat unsatisfactory manner; at one time British reinforcements were actually sent up to Thayetmyo and steamers stood by ready to take them further on if necessary, but the tension died down and the force was recalled. Another incident illustrates the difficulties which had to be faced. At the end of 1884 when the steamer “Kahbyu” arrived at Bhamo she found the town in possession of Chinese raiders and the missionaries and other Europeans, as well as a large number of Burmans, in grave danger. Capt. J.A.C. Terndrup, a Dane by birth, was then only twenty-four years of age, but he was a striking personality and just the man to deal with a difficult or dangerous situation. He had a good ship for his purpose, with admirable quarters for European passengers and, with her flats, capable of carrying about 1500 Burmese passengers on deck. When the raiders looted and burned the town, a large number of refugees crowded on to a sandbank in the river. Capt. Terndrup dropped one of his flats to pick them up and then took his ship to the burning town to rescue the Europeans. By that time his coal was running low and he went downstream to land them, then coaled and returned for more. Altogether he saved about 600 British subjects and a very large number of Burmese, for which he received a letter of thanks and a gold watch from the Indian Government. The year 1885 was to prove a momentous one for the Company, for the Third Burmese War was brought to a satisfactory conclusion largely through the help given by the “Flotilla,” without whose ships the transport of the expedition to Mandalay would have been impossible. Twenty-four of the biggest steamers towing twenty-three flats were engaged on the trooping side, carrying an expeditionary force of about 9500 officers and men, with 77 guns and the necessary stores, up the river to Mandalay. Many of these transports had exciting experiences. Most of the Flotilla’s other ships were engaged on various work connected with the war. The campaign began at the end of October when the “Ashley Eden” under Capt. J. Cooper, was sent up from Rangoon to Mandalay with the Indian Government’s ultimatum to King Thibaw. The whole crew had volunteered for the duty, the danger of which was obvious. Capt. Cooper’s orders were to deliver the ultimatum personally and await the reply, with banked fires, until November 5th. An unsatisfactory reply was given and the steamer immediately got under way but was fired at by a number of Burmese forts on the way down. That was the signal for many attacks on the Flotilla’s steamers. The “Doowoon” escaped from Mandalay with difficulty and at Minhla the Burmese tried to trap her by hoisting the signal that there were passengers waiting to embark. Unfortunately for them the troops in ambush were not sufficiently hidden and she steamed on. The Palow” ran the gauntlet of the Burmese forts by disguising herself as a Burmese prize flying the peacock flag, which quite deceived all the garrisons until she had reached British territory. 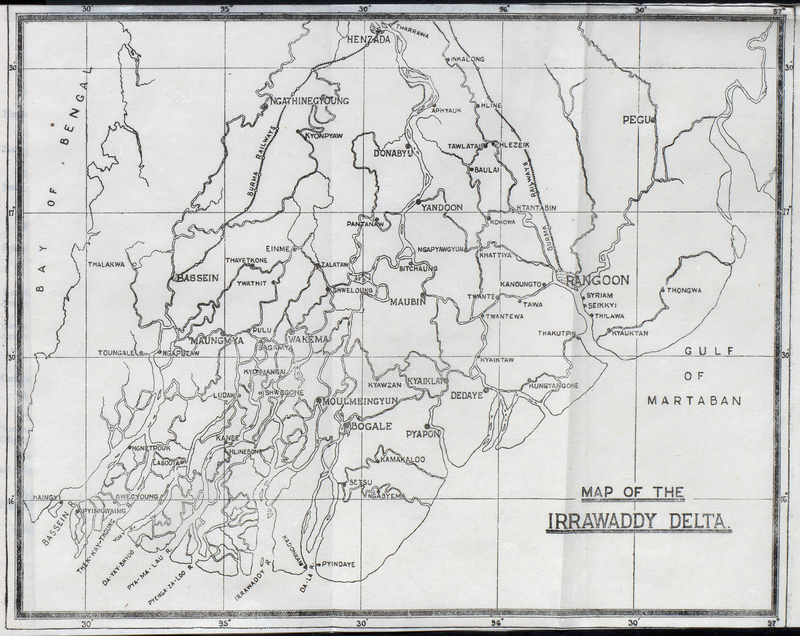 The “Okpho” went upstream from Mandalay to withdraw all British subjects from Bhamo but was seized at Moda. Capt. Redman and his crew were taken prisoner and the Capt. led out several times for execution, but the prisoners and ship were subsequently recovered at Mandalay. Before the fighting started the “Kahbyu” took a number of Burmese ladies of high rank from Bhamo to Mandalay and then got away. two other minor expeditions were organised in which “Flotilla” steamers took the principal part. The one to Bhamo made up on seven steamers as gunboats and transports, encountered more trouble from low water than from Burmese opposition. It only just forestalled the Chinese who were preparing to attack the town. The first vessels of the Company were mostly built by a firm which had built a number of fine sailing ships for Henderson’s, Duncan’s in Port Glasgow, but, as mentioned above, Denny’s built the “Taiping” in 1877, the first of a long line of successful vessels. She was built of steel. By the beginning of the “eighties” the main river paddlers ran up to nearly 260 feet in length. The task of designing such a ship was a difficult problem, as powerful engines were required to give her a good speed against the swift current and sufficient structural strength to avoid breaking her back if she stranded on one of the numerous shoals, no infrequent occurrence on an un-buoyed river. At the same time economy in weight was a major consideration and Denny’s made a careful study to secure it; their early adoption of steel instead of iron helped immensely, and this combined with the scientific use of materials and the careful reduction in resistance in the hulls, made the Yard’s reputation for shallow draft vessels all over the world. The routine in those days, which continued throughout the life of the Company, was for each paddler to tow two flats, one on either side, carrying the main bulk of the cargo. With this handicap, the bigger ships contrived about six land miles an hour against the current. They anchored at night. The principal Rangoon-Mandalay service was maintained twice weekly in either direction, from Rangoon to Henzada three times weekly and from Mandalay to Bhamo fortnightly. From Prome to Thayetmyo was a daily service. The run from Rangoon to Thayetmyo took six days, another six to Mandalay and six more to Bhamo. All the way up and down the river and on its tributaries on either side minor services, called ferry services, covered short stages. Each demanded tonnage of different characteristics – twin-screw, paddle or stern-wheel – and many of them different types according to the season and depth of water. Just previous to the expedition of 1885 a new standard of mail steamer had been set with the Denny built “Yomah” and “Mindoon,” the first of the paddlers to exceed 300 feet in length. On dimensions 310 feet by 40 feet beam, they had a gross tonnage of nearly 900. Compound jet-condensing engines were supplied by four Scotch boilers with a pressure of 90 lbs., two forward and two abaft the engine room. Their two widely spaced funnels gave them a most impressive appearance which was not lost on the natives and became characteristic of all the big passenger steamers for years. To provide strength for such a hull demanded very careful calculations and special measures, one of which was hogging the decks in an arch amidships. The main deck was devoted to light cargo and a certain number of native passengers, besides housing the European crew, the clerical staff etc. Forward on the upper deck were situated the firstclass cabins with the saloon between them and a fore-deck protected by awnings from the sun. The second class was right aft and between them on the upper deck were carried the crowds of Burmese deck passengers, who brought a colour and life which remained one of the pleasantest features of river travel. staff of Indian and Burmese pilots who travelled up and down by each vessel over stated beats, the whole organisation being in charge of a European Superintendent. All the buoying was provided free to all users of the river yet the Company had no power to stop a vessel drawing 6 feet venturing into a 5 foot channel, grounding and completely ruining it. Steamers at first went alongside the river bank to land their passengers and cargo, but in time at all important stations a flat or an old steamer was moored to act as a landing stage. It would have been folly to built permanent landing stages, as, apart from the tremendous rise and fall of the river, the landing ghaut at a town might move several miles in a few seasons due to the vagaries of the river. These floating stages served as storage for coal and cargo and agency officers were often located on them. As soon as the war was over and upper Burma annexed trade increased rapidly, both in passengers and cargo, and several of the services had to be augmented. The main run from Rangoon to Mandalay and the extension from Mandalay to Bhamo increased and most of the other services were augmented and new ones introduced. For some years, however, it was necessary to carry military armed guards on all ships to drive off the dacoits who amused themselves sniping from the jungle on the river bank. To cover the increased activity several paddlers were brought from the India General Steam Navigation Company, but they were not up to “Flotilla” standards and unsuitable for the Irrawaddy and were soon sold back and replaced by ships built to special design. The Denny Yard and Engine Works at Dumbarton, working in co-operation with the Flotilla officials who knew the conditions of the river so well, kept the new ships well abreast of all the technical developments which were practicable. The “China” of 1888 was the last of the big ships to be fitted with jet condensing compound engines; that type of condenser was then abandoned owing to the damage always done to the boilers by fine silt in the river water. The compounds were replaced by triple expansion engines in the next class of big ship which began with the “Hindostan” in 1897. She had a gross tonnage of 1227 and engines of 1700 indicated horse power. A great deal of space was saved by installing three Navy type boilers, with a pressure of 160 lbs. to the square inch instead of 90, in a row in one stokehold forward of the engines. She and the 326 feet lone mail ships which followed were a most successful type from every viewpoint, except that the arrangement of the machinery permitted a single funnel and the Burmese were not nearly so impressed by that as they were by the two funnels in the earlier ships. While trade between Mandalay and Bhamo also improved it never fulfilled the sanguine expectations of those who contemplated a huge business in the trade with the Yunan Province of China. There had been a Burma/China trade for centuries; the traffic was carried by mule caravans between Bhamo and Tengueh, mainly cotton outwards from Burma and silk inwards, but disturbed conditions prevented great expansion, though schemes for railways and roads were always being hatched but died away for lack of support. The Burma Railways eventually reached Lashio in the Shan States, providing another terminal for pack trains, and the French Railway came into Yunnan from Tonkin, all serving to confound optimists like one Bhamo Agent who could write in the 90’s that “Bhamo was bound in time to become the Chicago of the East!” Nevertheless one curious trade arose on this section and remains to this day. Due to the disturbed state of the country after 1885 traders feared to settle in riverside towns where stocks were liable to pillage, so a “Bazaar Steamer” was run. On a double decked flat towed alongside was a regular bazaar selling all sorts of goods – clothing, food, ironmongery. At each stopping place the entire population surged on board and a hectic house of bargaining began. At length the siren blew, the reluctant villagers were hastened ​ashore, the anchor came up and the steamer departed leaving the village to the usual calm which brooded over it from one weekly bazaar day to the next. Another particularly important new trade was opened in 1886. When the Burmah Oil Company started operations at Yenangyaung the river route was the only means of getting its crude oil down to Rangoon and the “Flotilla” built a number of tank flats – locally known as “islands” – which were towed up and down stream alongside special steamers like the cargo flats on the other routes. The round trip between the oilfields and Rangoon generally lasted about ten days. Some of the larger flats carried over 900 tons of oil and they were loaded according to the regular reports on the depths of water in the channels. They normally went up empty but when necessary they carried up to the fields, pipes, machinery and stores, sometimes brought out from home by Henderson steamers and sometimes by the Burmah Oil Company’s own tankers. This oil business became very important and lasted for many years. The “Pekin” class of 250 ft. paddlers were specially designed for towing the oil flats. After the Burma War of 1886 a Dockyard and sawmill was established at Mandalay to maintain the steamers on the upper river and at the same time it was open to accept any local business that might be offered which, in the absence of other facilities, was quite profitable. When the whole of Burma eventually came under the control of the British and the dacoits had been suppressed, the business of the “Flotilla” increased by leaps and bounds. The Burmese fully appreciated the fact that without the services they would be deprived of most of the amenities which they were beginning to enjoy, the good business that they established by supplying the big towns on the lower river, and the export trade, which also grew rapidly. Everybody of importance from Viceroys down to local officials used the “Flotilla” steamers and when H.R.H. Duke of Clarence visited Burma in 1889 the “Beeloo” was put at his disposal as the best means of letting him see as much of the country as possible. His visit drew attention to the possibilities of the country for tourists and a business gradually grew up, particularly on Mandalay-Bhamo section where full complements of tourists from Europe and America were carried for many years in the pleasant cold weather months of December to February. Meantime at the other end of the country was growing the vast Delta traffic. From very early days a service had been run to Bassein, then almost the only town of importance. The Delta had been devastated during troubles in Burma in the late 18th century, when its population was carried off and the land reverted to jungle. Gradually the demand for rice in India increased and by the 1890’s a few services were running on routes where the jungle had been cleared and paddy planted. From then on till 1929 the rise was steady as more and more land was brought into cultivation and in the end a hundred craft at least plied daily in this area. The paddle steamer had no place here; the twin screw double decked launch for passengers and mixed traffic, the cargo barge with hatches forward and engines aft, also tugs and lighters for rice and paddy traffic held the field. The size of the double decked launch grew gradually from about 80 feet long to 115, barges being about 100 feet long and carrying 100 ton of cargo. The personnel on the Delta vessel was almost entirely Indian and the navigation at night was magnificent, searchlights being used as an aid. at the various calling stations. During the low water season draughts had to be kept down by bunkering with small quantities as frequently as possible. In vessels plying out of Rangoon sawmill cuttings were also used as fuel. At about the turn of the century the mail steamers and those employed towing the oil barges had their boilers converted to burn residue oil from the refineries which at that time would have been wasted. The experiment was entirely successful. The oil was carried in the holds of the steamers in tanks heated with steam and pumped up into service tanks on deck, whence it ran down to the burners by gravity, steam from river water being used as the atomising agent. Unfortunately the scheme did not continue for very long, for the refineries found means of taking more and more out of the crude oil until it was almost useless for raising steam and was certainly not economical. Ships therefore reverted to coal on the services where it could be most conveniently obtained and finally, soon after the First World War, the burning of oil fuel ceased altogether and all the ships’ boilers were converted back to coal. When the Prince and Princess of Wales, later King George V. and Queen Mary, visited Burma in 1906, the “Japan” one of the newest mail steamers, was put at their disposal. She was only two years old, of 1320 tons with admirable accommodation. With her white painted hull and her funnel yellow she looked remarkably well, although the “Flotilla” steamers never lacked a smart appearance with their black hulls and black funnels with red band. The “Mogoung” went ahead of her as pilot vessel to warn all steamers and native craft to get out of the way as the river was very low at the time, but unfortunately she ran aground on a new sandbank soon after leaving Mandalay and Capt. de la Taste continued the voyage of the “Japan” without her assistance. What appeared to be a serious check in the Company’s prosperity occurred in 1908 when the Burmah Oil Company built a pipeline to Rangoon. This naturally made a considerable difference to the volume of business, but a good deal of oil continued to go down river for other companies, and alternative activities were soon found to restore the balance. In the same year the Burma Rivers Transport Company was established and in two years had built up a fleet of 22 steamers and 20 oil flats, towing crude oil for the Rangoon Oil Company, also carrying passengers on the main river. Their competition was serious for a time and two remarkable little 15½ knot ships, “Otaru” and “Osaka,” with watertube boilers and many improved features were built by the Flotilla Company as “shadowing steamers.” The competition did not last for long; and in 1911 the Flotilla bought the B.R.T. fleet and other plant. Two years later it also bought the fleet of the Delta Navigating Company passenger launches similar in type to the “Flotilla” craft in that area. The manner in which the fleet was kept up to a high standard, and the progressive improvement of every type of vessel for its particular work was only possible by the very prudent and conservative financial policy which was always followed by the Board of Directors. Dividends were never high and profits were regularly “ploughed back” into the business. This careful policy bore fruit in the period after the 1914-1918 war when considerable replacements of vessels were necessary. During the First World War the first trouble was coal; tonnage was not available to bring supplies overseas and even the biggest river steamers had to fall back on wood. It was procured from the Wakema district of the Delta and transported to Rangoon and other bunkering points in old cargo boats towed by launches. Oil cake, which was produced in large quantities, but which could not be exported owing to the tonnage shortage, was also used for fuel, but it introduced cockroaches into the ships to the great annoyance of the officers who had always been very proud of their clean condition. The fleet had been indispensible during the Third Burmese War but no ships under the Red Ensign appeared to be of less use to the Fighting Services when the First War with Germany broke out in 1914. When Turkey joined in and the Mesopotamian campaign began, it was a different matter and there were no vessels in existence better suited for the conditions on the Tigris and Euphrates. Nothing in India or Egypt could compare with them and immediate steps were taken to requisition many of them in spite of the obvious difficulties of taking craft designed entirely for river work on the long sea voyage round the south of India. Altogether the Government took up sixteen of the Flotilla’s paddle steamers, ten stern-wheelers, six creek steamers, five twin-screw tugs, six steam barges, six pilot launches and forty flats and cargo boats. Some of the bigger vessels were ordered to make the passage under their own power, but most of them were towed. Naturally all of them had to be strengthened for the passage, but in spite of these precautions three of the stern-wheelers and one steam barge foundered while under tow. Everybody expected the casualties to be much heavier than that and it was a fine tribute to the construction of the ships. The war period in Burma was very much a time of “make do and mend.” Replacements of vessels impressed for use in Mesopotamia and those wearing out in the ordinary way were very difficult to obtain. A few new paddlers and creek steamers were obtained from Home and Yarrows undertook to build several stern wheelers to replace those sent for war service. The hulls of these were built at Yarrow’s establishment at Equimault in British Columbia, the engines on the Clyde and the boilers at Lincoln; the whole being fitted together at Dalla Dockyard in the usual way. After the conclusion of the war in 1918 and while orders were being placed for new ships the Company naturally tried to get its steamers back from Mesopotamia, but that was not easy and took time. The “Tantabin” “Hanthawa” and “Tharrawa” for instance, were employed running a bi-weekly passenger and mail service between Basra and Amara. The authorities had steamers to cover that work, but those of the “Flotilla” were so much more efficient that they were kept running and the Government ships laid up, to the annoyance of the Company. The period between the wars was one of steady expansion and improvement, new services were started, old ones were improved. The “mail” steamers on the main river gradually ceased to carry mail, this duty being taken over by the smaller “ferry” services. The run of the “mail” steamers (latterly referred to as Express Steamers) between Rangoon and Mandalay was gradually pared down from nine days to five, night running being introduced over long stretches of river, necessitating a scheme of relieving Commanders. The Delta traffic increased with great rapidity, a new business of full rice cargos growing up from 1922 onwards. In the old days the export paddy crop of Burma was almost entirely milled at large mills situated in the Ports, but the big mill gave way largely to small mills situated near the growing crops. The first cargoes of the “jungle” rice were dealt with by the existing tugs and cargo lighters originally used for bulk paddy, but over a short period of years a whole fleet was put into commission to handle the business. The typical unit was a diesel-engined barge of 120 tons, with two lockfast hatches forward, towing two dumb barges also of 120 tons capacity. On arrival at Rangoon the units were placed alongside deep sea steamers for discharge. In addition to the Dockyards at Dalla and Mandalay a second large Dockyard was acquired in Rangoon in 1904, known as Rangoon Foundry. Here repairs and eventually also erection of the small type of craft was carried out and general foundry work also done. A small Dockyard for the maintenance of the fleet on the Salween, Gyne and Attaran rivers was also maintained at Moulmein. In 1933 the Company purchased the Pezundaung Foundry which had previously been owned by Bulloch Brothers and carried out general engineering work there. During the years 1934 to 1939 a small subsidiary Company was floated in Rangoon, Irrawaddy Flotilla and Airways Ltd., to operate seaplane services. The Company owned in all four seaplanes, three of which were of the Short Scion 8 passenger type. The services however did not pay and were withdrawn. For some time before the outbreak of war with Japan in 1941, large quantities of materials were carried up to Bhamo from Rangoon for onward transit to China – aeroplane parts, ammunition and other warlike stores. At Dalla Dockyard also the building of patrol boats for the Navy was undertaken and orders had been received and a start made with some minesweeping trawlers. The first section of the Company’s business to feel the impact of the Second World War was the detached fleet based at Moulmein. A few casualties were suffered by bombing and as the Japanese closed in on Moulmein some of the newer vessels were courageously sailed to Rangoon while the remainder were scuttled and the Dockyard set on fire. When the Japanese invaders reached the SIttang river, Rangoon was evacuated and many of the Company’s vessels commenced to carry refugees up river. Some of the Company’s European staff were amongst the last to leave Rangoon after the demolitions had been effected and included in those were “last ditchers” who accompanied the demolition parties on Company’s launches to ocean going ships which were waiting to take them out to India. The launches were then sunk on completion of their task. Gradually the invasion swept our forces back and after concentrating a great number of vessels of the fleet at Prome, from where large quantities of stores and many refugees were carried on up river, almost the entire fleet, with the exception of the Chindwin vessels, were assembled at or near Mandalay. During this time the ships on the river were easy targets for Japanese air activity and attacks were frequent. However, the requirements of the army were fully met and in addition refugees were carried on as far as Mandalay and in many cases beyond and also up the Chindwin. Finally when the order was given for the army to be withdrawn from Burma the main part of the fleet was denied to the enemy by scuttling at Mandalay and at Katha. 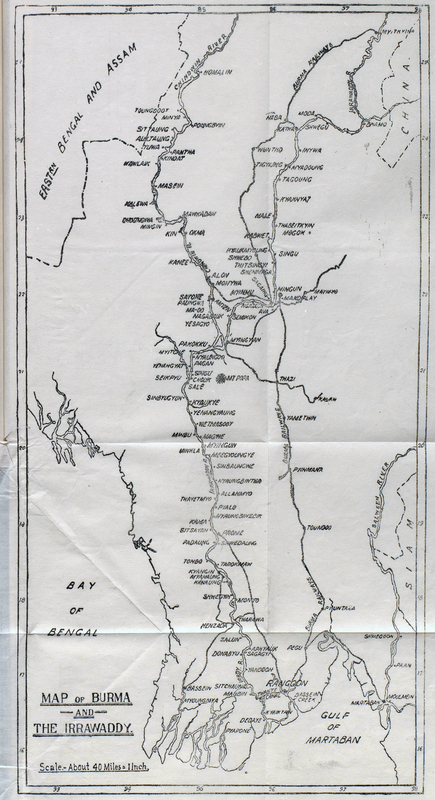 From there most of the European staff, headed by the Manager of the Company Mr John Morton and accompanied by the last remaining Indian crews, made their way on foot across to the Chindwin valley and thence to India – a distance of some 250 miles. The final scene took place on the Chindwin when the main body of the retreating army was ferried across the river at Kalewa – an operation lasting several days and carried out without loss. Thereafter the Chindwin stern-wheelers were sunk or set on fire at Sittaung in the Upper Chindwin. For services at the Kalewa Ferry, Mr J.S. Murie, a Chief Engineer of the Company, was awarded the Military Cross by General Alexander. In an earlier part of the campaign Capt. W.H. Rea received the same decoration for the part he played in carrying a Commando unto the Henzada area. were suffered by European, Burmese and Indian staffs alike. Many of the Company’s European staff were commissioned thereafter in the Indian Army and served with the Inland Water Transport in Persia, Iraq, India and later took part in the re-occupation of Burma by General Slim’s 14th Army. In agreement with the Government of Burma, the Company restarted operations in January 1946, by which time 110 vessels, 22 powered and 88 dumb craft, were handed back by the army, having been recovered either afloat or in accessible positions. P. Henderson & Co., as Managing Agents, a position they had continued to hold throughout the Company’s history, proceeded in conjunction with the technical staff to plan and order a new fleet embodying all the latest and up-to-date knowledge gained over the years by the Flotilla Company personnel. A number of wooden built army vessels were used in the early stages to augment the fleet and meet the immediate needs and within a short time a nucleus of the old services had been started up giving a great stimulus to the shattered economy of Burma. This great effort at rehabilitation was only gaining impetus when the decision to nationalise the Company’s activities was taken by the new Government of Burma and the transfer actually took place on 1st June 1948. So on that date there came to an end this fine venture which had done so much for the development of Burma. At its peak, in the early part of this century and up until the outbreak of the Japanese war, the Company’s offices, fleet and Dockyard directly employed between 9000 and 10000 persons, apart from the many people who were employed indirectly on firewood supplies, etc. On the ships the crews were mainly Indian with European Commanders and engineers on the larger vessels. 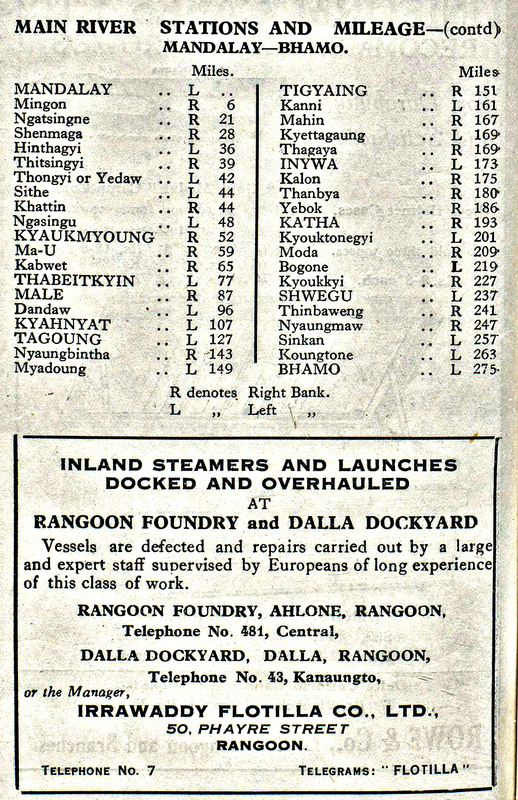 Dockyard employees were in some cases Indian and in some Burmese, with European Superintendents and Foremen. Office staffs were almost entirely Burmese as were the clerks on the ships. In view of its origin, it is not surprising that the great majority of those who formed the management in Rangoon came from North of the Tweed, especially from the West of Scotland and many were recruited from the staff of P. Henderson & Co. Amongst its Directors have been many men notable in Glasgow and the West of Scotland. Sir George Peat was joint Managing Director with Mr Borland from Mar. 1945 to his death in June 1945. At its zenith, between the Word Wars, the Flotilla Company was one of the greatest, if not the greatest, riverine companies in the world. Its fleet of some 650 vessels of all types carried annually up to 1,300,000 tons of cargo and close on nine million passenger at that time. Thanks to the prudent financial policy followed by the Directors and the capable handling – both during and after the war – of the delicate and protracted negotiations with both H.M. Government and the Burmese Government the Stockholders received when the Company was wound up – for each £1 share – this despite the fact that the settlement with the Government of Burma was for a sum less than a fourth of the amount claimed.